An Amazon posting leaked the new setting, the first officially published crossover between the two worlds. In the 20 years since Wizards of the Coast bought Dungeons & Dragons they’ve never truly explored the obvious crossover between it and their most popular product: Magic: The Gathering. The answer was always that they were two separate products which existed in their own separate worlds. That’s not true anymore. A product listing went live Sunday on Amazon showing off Guildmasters’ Guide to Ravnica, a Dungeons & Dragons setting supplement for playing on Ravnica, one of Magic’s most popular settings. Today, Wizards of the Coast confirmed that the book will release on November 9th in game stores, November 20th to the public. They also confirmed, and immediately released, a digital guide to adapting older D&D setting Eberron to 5th Edition D&D. Ravnica is a city the size of a world ruled by ten scheming, competing guilds, each of which represents a combination of two of Magic’s colors of mana and regulated by powerful, world-spanning magic called the Guildpact. Wizards of the Coast had previously announced that a new Dungeons & Dragons setting book would be announced today on a livestream. Previous announcements gave that date as the 22nd, a possible reason that the product listing on Amazon went up early yesterday. This isn’t actually the first official crossover material. For a few years, former D&D writer James Wyatt has worked on the Magic: The Gathering team, and with each artbook released for the last few Magic settings has put out a small, free digital supplement about playing D&D on each of those worlds. So far the worlds Zendikar, Innistrad, Kaladesh, Amonkhet, and Ixalan have been given the treatment. Clearly those supplements have proved popular enough for Wizards of the Coast to greenlight the unprecedented step of an entire crossover setting book. The official listing on Wizards of the Coast's site includes the hardcover book Guildmasters' Guide to Ravnica, a set of Ravnica dice, and a book of 'maps and miscellany' - something wholly new for 5th Edition. While other information about Guildmasters' Guide to Ravnica is thin on the ground, we can learn a bit from the Amazon listing. The shipping weight is listed at 1.2 pounds, which would make Guildmasters’ Guide to Ravnica the smallest D&D book yet for 5th Edition Dungeons & Dragons, smaller even than Sword Coast Adventurers’ Guide at 1.4 pounds. 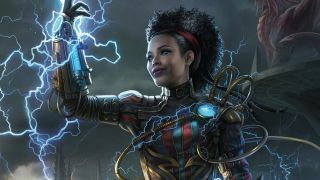 The next cycle of Magic: The Gathering sets releases in October, called Guilds of Ravnica, and is the third set of Magic cards to use the Ravnica setting.